How far can you go back without losing the details? Which ones do you push to the back of the shelf, the memories that are quickly flicked by as you make your way to the old favourites. Which details have received a sand down and a buff, a little gloss added to give it more shine. When we head back to Granny’s house each year, I return to my room. A room that has the old bridesmaid dresses hanging next to the year twelve school uniform. A room with t-shirts I can’t bear to let go and jackets that might come back into fashion. Every year I flick through the contents of drawers in the hope that I’ve missed an undiscovered gem. I cringe at old photographs and then place them right back where I left them. I have my own house in Australia now, but these are the things I choose to leave in limbo, in the old, old life. Perhaps it’s a feeble attempt of keeping a little piece of me in my hometown, or maybe I don’t want to take those memories with me. I like them to stay tucked away. In the back of one of the drawers was a diary. A diary full of self absorbed, highly anxious, teenage angst. A diary that has been there forever but rarely opened. A quick glance at the handwriting and the names had me pushing it to the back of the drawer. Thirteen year old Kirsty. I didn’t want to go there. It wasn’t that great the first time. I didn’t really like that girl very much. And I’m still confused to how I feel about her now. This year I took the diary with me. All the way back to Qatar. It wasn’t a conscious decision, it just came along with a few other bits and pieces. It was here that I found another drawer, and once again there it went, straight to the back. I couldn’t throw it away, but I didn’t want to revisit it. “What’s this?” the second little traveller asked while looking for a pencil. “Can you read it to us? She was smirking at the PRIVATE that was written in block letters on the back cover. Instantly being able to sniff out the idea that something was happening without them, her two younger brothers arrived in the doorway. “Erm, let’s see, let me have a look and see what I can find” I knew if I said no, the diary would instantly become more of a must see item. I had forgotten. I’d forgotten how confusing thirteen was. My diary serves as a reminder that if the details are blocked for long enough they slowly fade. “Tania and I bludged assembly and had a smoke in the toilets”. I was unknowingly auditioning for the lead role in Puberty Blues. “Stinky told me he just wants to be friends”. I liked Stinky? Really, I liked Stinky?? I was constantly terrified of what I was about to do, but exhilarated that it wasn’t what I was supposed to be doing. I was hovering on the edge of childhood. Balancing precariously between being so excited about the upcoming netball grandfinal and the school play, but knowing that the boy who wanted me to get into his ute with him at Nicole Morgan’s farewell party wanted more than a quick pash. 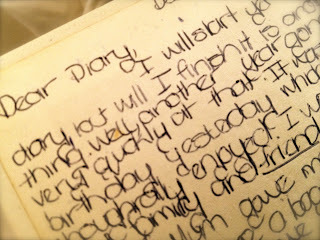 The diary stayed tucked away because just like thirteen, it felt embarrassing, I didn’t like going back there. The bad grammar, the poor judgement, the brutal evidence of complete self indulgence. The diary took me back to an awkward place, a town where I felt I belonged in the scrum yet was constantly trying to jostle my way into the huddle. Who said that? Why did they do that? He doesn’t like you? She wants to be with him. My 44 year old eyes have now skimmed each page, this time I managed a giggle at my “secret codes” and shook my head at my lack of understanding of what was really going on. I read pieces out to G, and made a mental note that I had to make sure I made more time for proper catch ups instead of quick fly by’s this year. And then I pushed the diary back into the back of a drawer, where it belongs, in the past. Things have changed, I’m not sure who that girl was exactly, but she’s gone now. 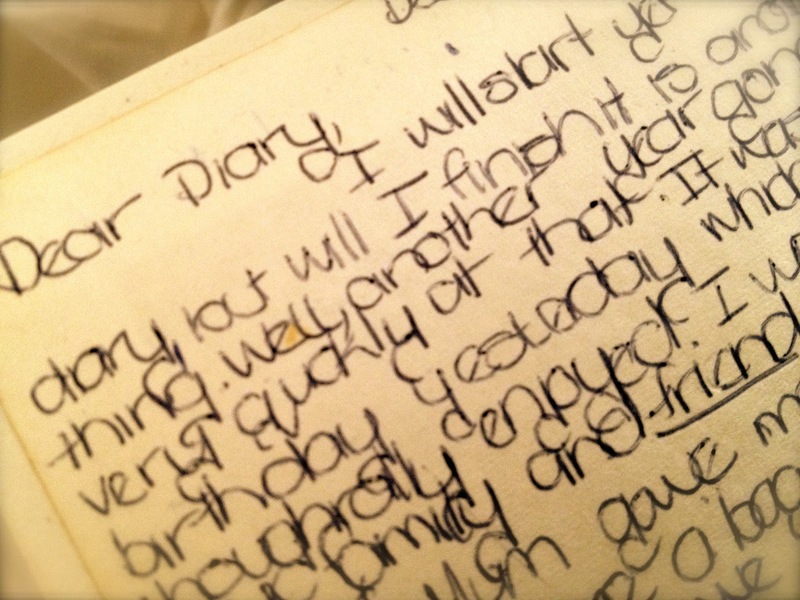 Do you have an old diary?